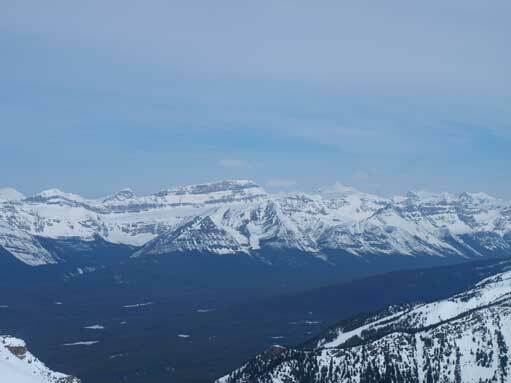 After a early-season scramble ascent of East End of Rundle I didn’t want to go home yet. 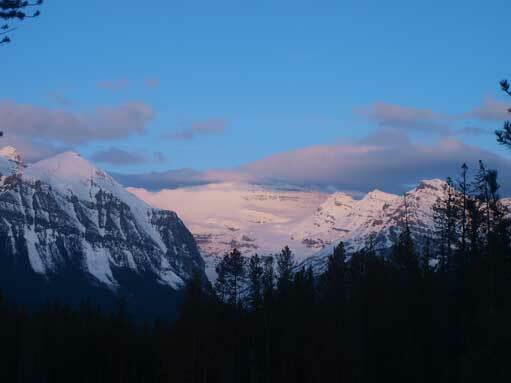 The weather was looking good and temperature would drop to -10 degree at Lake Louise in the morning. 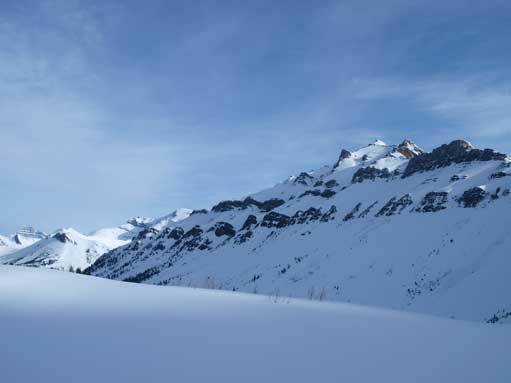 Taking advantage of the spring snowpack, I decided to do another snowshoe trip. 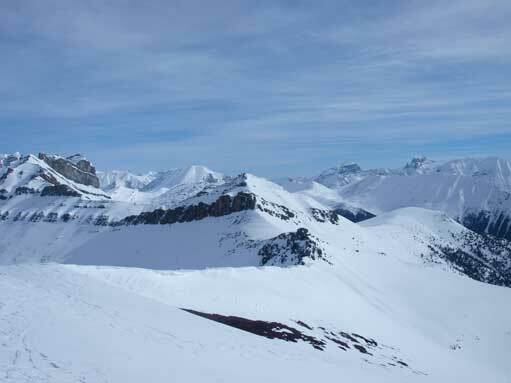 Purple Peak and Lipalian Mountain are among the easiest in Skoki area and together with the nearby Unity Peak they form the ski touring loop – the Pumpkin Traverse. 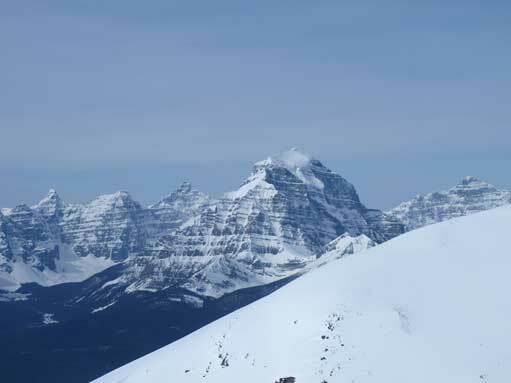 I wasn’t interested in the full traverse especially since I only had snowshoe gears, and my first objective would be Purple Peak via the safest, also the route described in Andrew Nugara’s Snowshoeing in the Canadian Rockies. While gearing up in the morning I met two skiers at the trail head by Fish Creek. I soon realized they were Josee and Fabrice, authors of goldenscrambles.ca. They started about 15 min ahead of me, heading to Unity Peak. At this time of year, Temple Lodge Road is snow free, so I can easily walk up the first 4 km while carrying snowshoes. 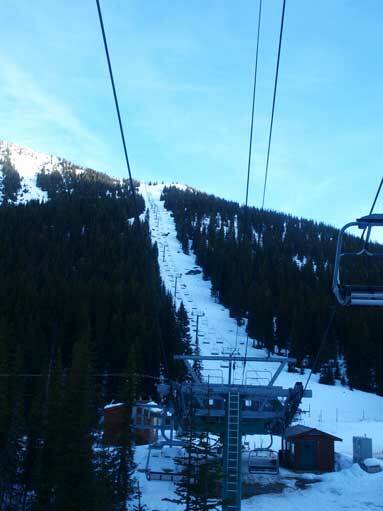 In no time I reached Larch/Ptarmigan chairlifts. 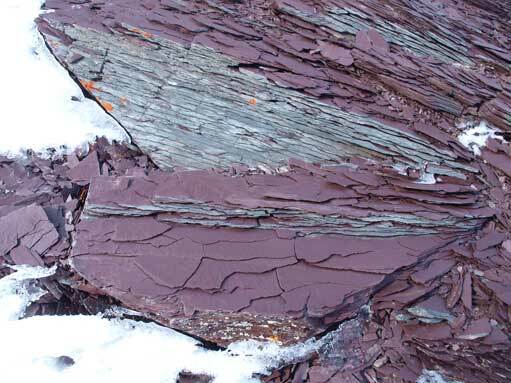 (The ski resort had already closed for the season). 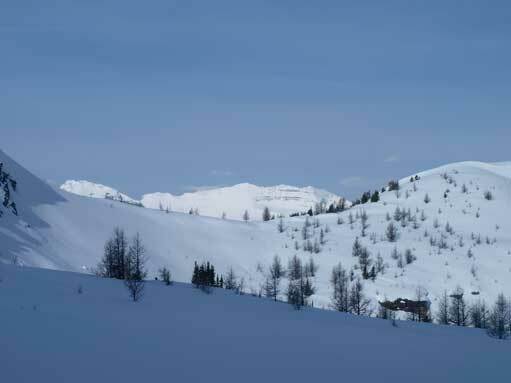 From there, the snowshoeing book describes to keep walking down the trail for about 1 km then head right, but somehow I missed the correct trail and ended up in the valley bottom. 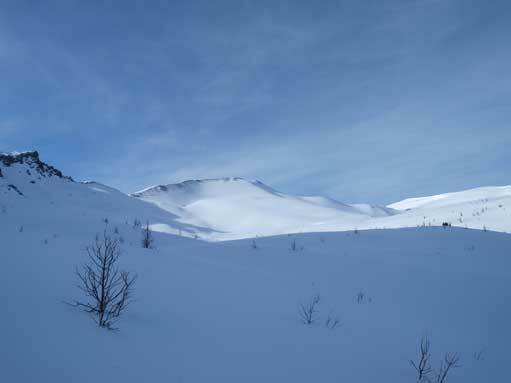 For the next kilometer, I could not find any track heading into Wolverine Valley, and I was getting closer and closer to the lower slope of Redoubt Mountain. I thought Josee and Fab would be ahead of me and I didn’t pass them on the way up, but apparently not. I started to realize my mistake, so after checking the map, I decided to turn sharply right and after some bushwhacking I did manage to get back on track. There was no steep section in the valley and it was a pleasant hike. 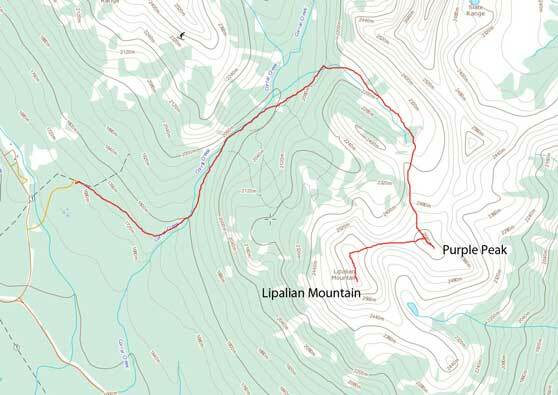 Purple Peak was directly in front of me and appeared like a rounded bump. 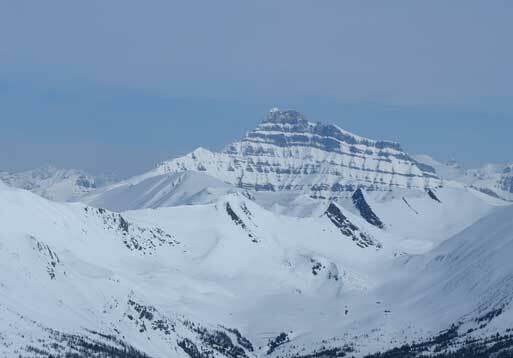 The route was obvious and I had the choice of either the north ridge or the north-east ridge. While both of them involved a short steep slope near the top the north ridge was the “normal” route so that’s the one I took. It took me 2.5 hours from parking lot to the summit. Lipalian Mountain partially blocked my view towards the Lake Louise Giants, but the view of Baker Creek area, Protection/Pulsatilla massive, and other mountains in Skoki was unlimited. Purple Peak at center. I’m already out of the trees now. Victoria shows up behind the Wolverine Ridge. 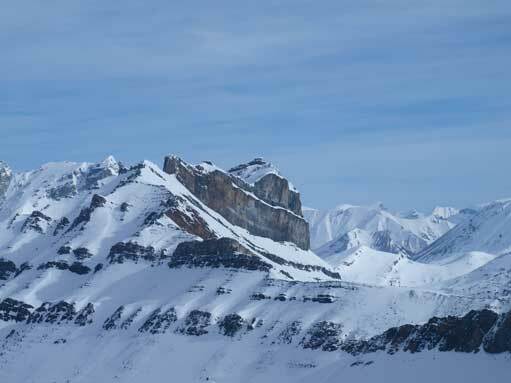 The Wolverine Valley goes beneath Redoubt Mountain. 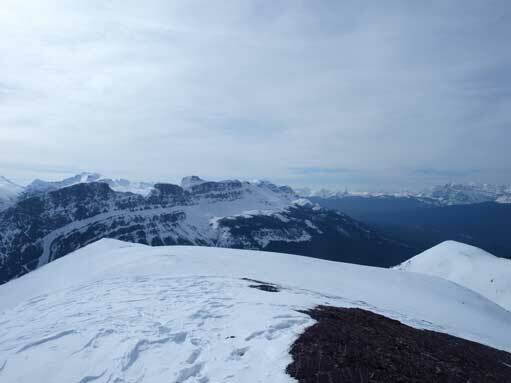 Looking far towards Waputik Icefield. Daly and Balfour are the big ones. 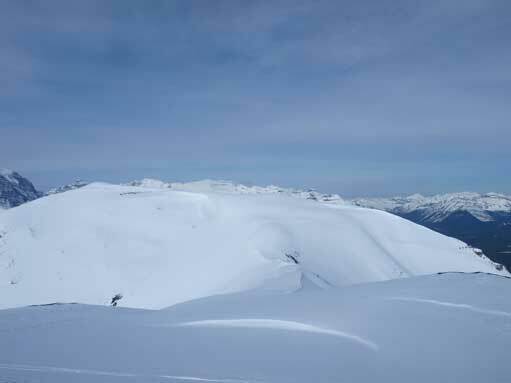 The connecting ridge to Unity Peak. Now I understand why this peak is called Purple Peak. 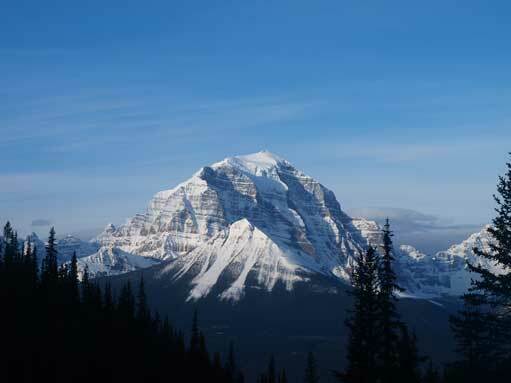 I didn’t linger any longer than necessary before traversing towards my next objective, Lipalian Mountain.